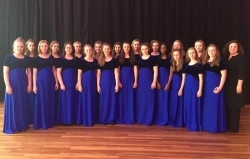 Last Friday Hereford Cathedral School's Cantabile Girls' Choir headed to the Royal Festival Hall with the Junior School Chamber Choir to take part in the Barnardo's School Choir of the Year. The girls were really nervous as they had never been to this competition before. The standard of the choirs was amazing, especially the junior schools who were singing in 3/4 parts. We performed two pieces for the judges; A Bunch of Thyme and Dance to Your Daddy. Naomi opened our set with a fantastic solo. The girls sang beautifully with wonderful balance and blend under the direction of maestro Jo Williamson. Rhiannon Davies was a very supportive accompanist. The whole day was really long and exciting with a concert in the evening (not judged) and two massed choir items with 26 choirs singing. Cantabile were not expecting to win so it came as a wonderful surprise to end the day. A huge well done to the Junior School Chamber Choir who did themselves proud in the junior competition. Many thanks to the parents who patiently waited for us to return to Hereford until the early hours.